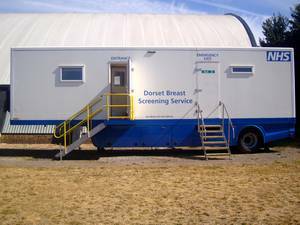 THE NHS MOBILE BREAST SCREENING UNIT WILL BE IN NORTH BEACH CAR PARK, SWANAGE, UNTIL SEPTEMBER 2018. PLEASE NOTE THAT FREE PARKING IS AVAILABLE IN THE COUNCIL'S NORTH BEACH CAR PARK FOR PERSONS ATTENDING BREAST SCREENING APPOINTMENTS. IF YOU ARE UNSURE WHERE TO PARK WHEN YOU ARRIVE FOR YOUR APPOINTMENT, PLEASE SPEAK TO THE SCREENING UNIT'S RECEPTIONIST WHO WILL BE PLEASED TO ASSIST YOU. THANK YOU.